How did I become The Intrepid Tortilla Chef? The answer is out of necessity. The family dinner seems to be a lost daily occurrence, but I love to eat and even more so sit around the table with my loved ones recapping the events of the day. What I find torturous is the daily duty of coming up with nutritious yet quick and easy meals. This past Monday I was really struggling to figure out our dinner plan. It didn’t help that our cupboard was almost empty and that I had zero desire to go to the supermarket. But then, when I was just about to throw in the towel and call it a ‘Pizza Night’, my culinary muse finally spoke to me! That was the moment when I became the Intrepid Tortilla Chef. It had been a while since we’d prepared tortillas at home, and I actually had all of the ingredients necessary to make them from scratch. Upon examining the cupboard I also discovered that I had 3 cans of organic beans which we decided to use to make black bean soup. Making tortillas is a lot of fun! 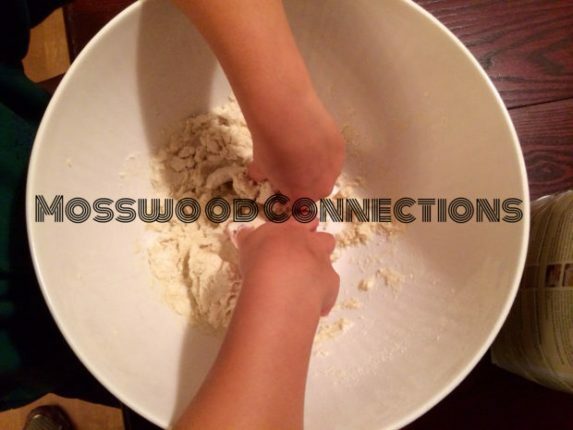 L loves mixing up the ingredients with his little hands and feeling the dough squish between his fingers. It’s a wonderful and purposeful sensory activity. He laughs at the “farty” sounds that the dough makes when he’s working with it, and while I discourage that type of “bathroom” humor, I have to admit that it is pretty funny. When the masa finally reaches the consistency of Play-Doh, he rolls the masa into a golf sized ball and then loads them into the tortilla press. If you’ve never used a tortilla press, let me tell you that there’s something very satisfying about flattening dough balls in a press. It’s much like the satisfaction you get from walking over crispy fall leaves. We followed the recipe on the Maseca bag, but also added some grated Parmesan as well as a little cayenne pepper. For the black bean soup, I had L chop up 3 carrots and 3 celery ribs while I chopped up an onion and three tomatoes. I pan-fried the onions, carrots, and celery until the onion was clear and then added the tomatoes as well as 2 garlic cloves and 2 tablespoons of tomato paste. We cooked that for a couple of minutes and then divided it into two batches and put it in the blender along with half of the beans and half of the chicken stock (we used 4 cups of stock total), then transferred it to a pot to simmer for about 45 minutes to an hour. We repeated the process with the remaining ingredients and added that to the soup pot as well. We added a generous amount of cumin as well as some smoked paprika and salt and pepper to taste. 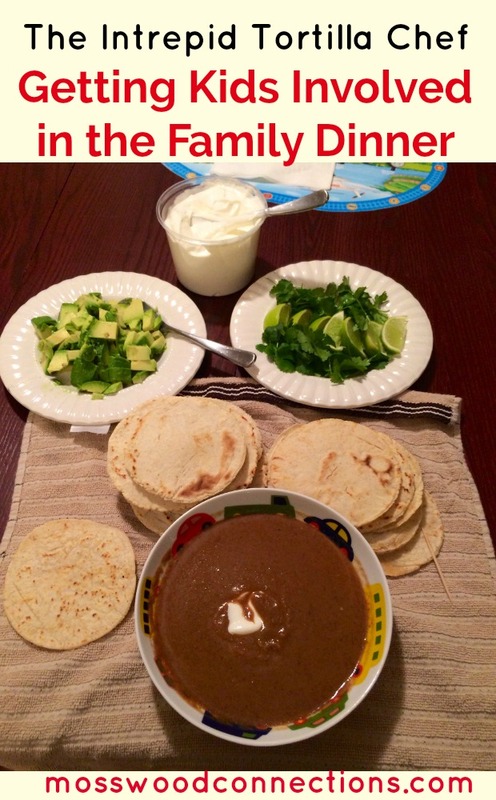 In the end, we had 18 tortillas and a big pot of black bean soup which we served with sour cream, cilantro, and avocado. Involving Children in Cooking the Family Dinner has Many Benefits! I try to involve L in the kitchen as much as possible and cooking the family dinner is a good time for us to cook together. This usually means that things will take longer, there will be a bigger mess to clean up and that it may not turn out exactly right but the benefits are worth it. Since L is a picky eater, I always find that he is much more eager to eat meals when he is involved in cooking them. 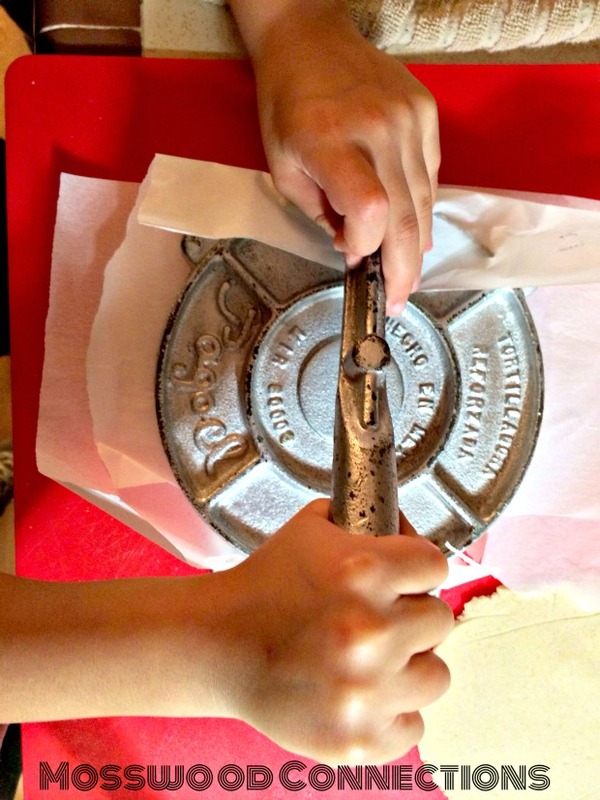 Cooking experiences build children’s knowledge and skills in science, math, and reading in a fun and meaningful way. They learn about measurements (teaspoons, tablespoons, and fractions of a cup) as well as following the sequences required for the recipe. And while they’re having fun kneading the dough, stirring or pouring, they are also developing hand-muscle as well as hand-eye coordination and fine motor skills (peeling, cutting etc…). This is also a good time to talk about proper nutrition and about making healthy food choices. It is through these conversations and experiences that I am helping my son to develop a lifetime of healthy habits. Last but not least, cooking is a great social activity. It requires communication and cooperation (teamwork), turn-taking and so much more. And what could be more social than sitting down to share a family meal you’ve worked together to create.